This uses the power of JQuery to select DOM Elements and Greensock Animation Platform (GSAP) v12 for the really crazy fast animation and sequencing. You can animate almost any CSS property of DOM elements including border, color, percentages, opacity, cool transforms like skewX, skewY, scaleX, scaleY, rotation, x, and y. There are no predetermined CSS parameters in the XML that you need to input. Simply animate only the properties you need to one or more DOM elements.Below is an example showing the css animation. XML Timeline Animation Banner is not only limited to DOM Element animation. It also provides a way to tween object properties. You can target a single object or even multiple objects using arrays. This great feature provides a flexible way to animate graphical objects in a Canvas element. Another feature is the ability to tween function-based properties. It will work if you have an object with a function rotation() that gets and sets a value. Also, it can also tween even if you have functions like setRotation() and getRotation(). Using timelines, you can offset the insertion point, align animations at the same start time or align them one after the other. You can even set a time that can be added to the start time of each animation. You can even go further by nesting timelines(timeline within a timeline). You can also have multiple banners that have separate controls in one page. Users will now have video-like controls (without the buffering) when viewing the animation. Repeat, pause, play or seek(time or label) anytime so your users don’t have to miss a thing. You can use labels that are precisely marked in the seek bar so your users will know when the next set of animation begins. All of which can be set in the XML . You can set multiple banners in one page using one XML . Each banner can have its own timeline sequence and controls. One xml can be reused in different pages requiring different banner sizes. This can cut cost because there will be no need to rework the same animation with different banner sizes. This can be achieved by using a combination of % based position and size. ImageSlicer uses CSS to conveniently slice and animate images just by setting the number of rows and columns in the XML . Combined with timeline sequencing, it creates cool image slice transitions. Most of the time you don’t need a banner animation to play when it is not currently visible in the page. With this feature, you can optionally specify to pause the banner animation when not shown in your page. This saves additional processor overhead especially with mobile devices. This helps attach events to DOM Elements without coding. Note: Images are not included in your purchase. Keywords: animation, autoplay, banner, controls, greensock, image slicer, intelligent, jquery, multi-size, slicer, slider, timeline, timelinemax, tweenmax, xml. 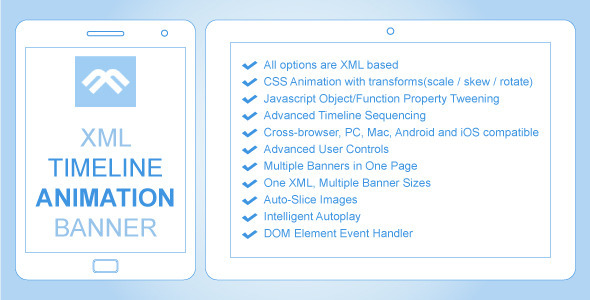 Premium CodeCanyon XML Timeline Animation Banner 2989764 WordPress Themes, Website Templates, Mobile Themes, Flash Templates & Scripts from creative professional designers. Full details of CodeCanyon XML Timeline Animation Banner 2989764 for digital design and education. CodeCanyon XML Timeline Animation Banner 2989764 desigen style information or anything related.